The State Library of Queensland is a good case study of the application of these modern design initiatives - an image of signage at the building which has symbols and Braille for people with impaired vision exists. 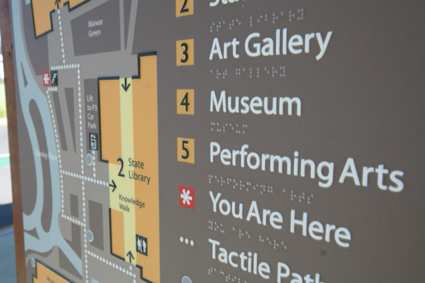 The image shows a map and signage providing three major functions of basic map design principles: orientation with present location and desired location, identification of locations and the use of raised tactile lettering and Braille. The image illustrates the physical placement, installation and illumination of signage must be suitable for all persons. 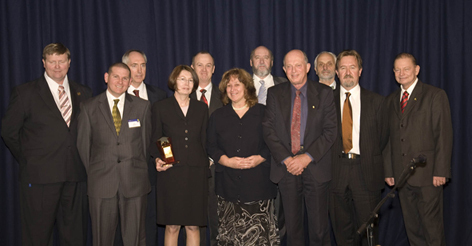 A Cooperative Research Centre for Construction Innovation project aimed at improving access to new and existing buildings for people with a disability has won the Queensland Governments 2007 Disability Action Week Award in the Building and Accessible Environments Category. The award for Wayfinding in the built environment was presented by the Queensland Governments Disability Services Minister Warren Pitt at a function at the Brisbane Convention and Exhibition Centre at South Bank today (17 July 2007). Queenslands Department of Public Works (QDPW) was a key participant in the project, along with the CSIRO, the Queensland University of Technology, the Australian Building Codes Board (ABCB) and the Building Commission. In congratulating the recipients, QDPW Minister Robert Schwarten said the project team had achieved a number of practical solutions to improving access to new and existing property for people with a disability. The project commenced in 2002 and identified wayfinding systems, technologies and devices appropriate for people with a sensory impairment, particularly people with vision impairment, Mr Schwarten said.It has also identified systems, technologies and devices making access to properties easier and safer for all people. The team has developed Wayfinding Design Guidelines to foster a reasonable, practical and comprehensive design approach to assist designers, developers, property owners and property managers in identifying ways of improving access to their new or existing property, particularly buildings and large complex facilities. Mr Schwarten said the guidelines represented material sourced from experts such as Architects, Landscape Architects, Lawyers, Engineers, Building Surveyors, Building Regulators, Access Consultants, people with local expertise, and, persons with a disability. The design guidelines are intended to be flexible within the context of a built environment and can be used by designers from a number of perspectives including systems for pedestrians, cyclists, drivers of vehicles, building occupants, and visitors, including local or international tourists. Team Leader, Ron Apelt, from the Department of Works, said the vision impaired are often forgotten in the planning and designing of buildings, public outdoor urban spaces and natural outdoor environments. Our document has been compiled with an emphasis on new buildings and the immediate spaces surrounding these buildings. However, the document is equally applicable for any upgrade proposals for existing buildings, improving wayfinding around large complexes, such as university campuses, hospitals, schools, Mr Aplet said. It is easily transferable also to urban spaces like malls and shopping centres as the design principles remain constant regardless of the type of spaces and places. Keith Hampson, Construction Innovations CEO, said: Any wayfinding system is more than just signs. It encompasses architecture, landscape architecture, interior design, lighting and cognitive landmarks. It is essentially about the design of spaces that should assist users in spatial problem solving by providing a consistency of clues throughout the spaces. There are four primary communicative elements (commonly referred to as clues) or criteria types - architectural, graphic, audible and tactile communication. It is recognised that an overlap of clues exist, however as a thinking and decision tool each of the primary communicative elements (clues) are broken down into a collection of questions to facilitate an informed decision-making process. The Building Code of Australia (BCA) provides a useful framework that lends itself as a codified means of ensuring some wayfinding devices and systems are implemented into a building and/or development project. The BCA has historically and principally dealt with health and safety and amenity issues (as they relate to health and safety). However, the BCA has progressively changed by systematically dealing with issues such as, the inclusion of a buildings functionality relating to its energy efficiency performance and access for people with disabilities to buildings as well as other matters not principally dealing with health and safety, Dr Hampson said.